Humidity affects the comfort level in the rooms of a home. If the humidity is too high, it can lead to the growth of bacteria and mold. If the humidity level is too low, the furnace goes into overdrive, and the air in the home can become dry and uncomfortable. Finding the ideal indoor humidity level for each room isn't a difficult process and can not only make the house more comfortable but also save your heating and cooling units from working too hard. Humidity in a house is important. Too much humidity in a home can cause wet stains to spread on walls and ceilings and can cause condensation to build up on windows and seep into the sills. Bathrooms can become moldy, or a musty odor may take root in the fibers of the shower curtain, towels and drywall. High humidity makes a favorable condition for bedbugs and dust mites to set up shop and multiply quickly. Too little humidity can also cause issues. When the humidity drops below 15 percent, it can cause a furnace to work harder, and it can build up static electricity in the home and create physical ailments such as scratchy throats and noses, itchy and dry skin and hair and chapped lips. The ideal indoor humidity is not less than 25 percent and not more than 50 percent in most cases. It seems that humidity is most prevalent during the hot summer months. However, humidity levels are just as important to monitor in the colder months of the year. A home's humidity level when the outdoor temperature dips below 20 degrees is no more than 35 percent. That level drops by 5 percent with each 10 degrees of drop in temperature. So, if the temperature is below 10 degrees, the humidity level should not exceed 30 percent. Colder climates tend to cause lower humidity in the home. Cold air doesn't hold water vapor, which keeps the humidity level below the desired percentage. 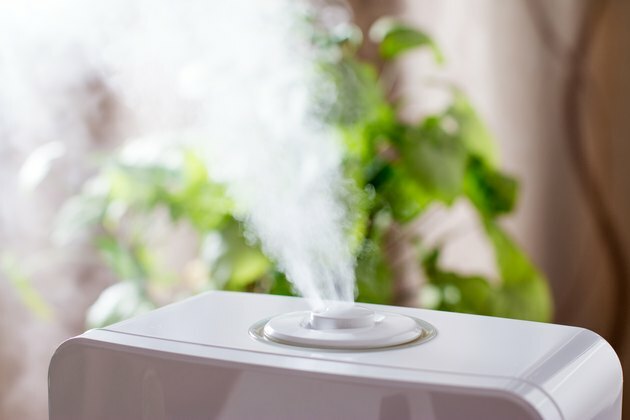 A humidifier can increase humidity levels quickly in any room. Pay attention to the amount of square feet you want to cover before purchasing and installing a humidifier. A small humidifier can cover a typical bathroom, whereas a larger floor-model humidifier can easily handle a living room or master bedroom. If the humidity level climbs to an uncomfortable level, fans and exhaust fans can move the moisture out of the area. A humidity level chart, which can be found online, can show you what the correct level of humidity should be for each room. The ideal humidity for a bedroom floats a bit above the recommended humidity levels for rooms in the rest of the house at about 45 percent. This is to keep the air moist enough to not cause scratchy throats or dry skin as you get a good night's rest. A bathroom's humidity tends to be higher at 50 percent after a lot of use but should not go above that to keep the space free from mold and mildew. The living room humidity level works well at anywhere between 30 and 50 percent, depending on the comfort level of the residents. If 30 percent is too low and causes minor irritations such as a scratchy throat, a humidifier can quickly bring the level up to a more comfortable percentage.